If your teeth don’t sit flush against one another, are twisted, crooked or gapped, you certainly aren’t alone. As our teeth erupt they may shift position, leading to misalignment problems. This is particularly true if you have a small mouth, where there simply may not be enough space for each tooth to come through straight. Unfortunately, crooked and poorly spaced teeth don’t only present a cosmetic problem. Patients with misalignment problems are significantly more likely to suffer from issues such as dental decay and periodontal disease, putting the health of your teeth at risk. Fortunately, there are two solutions that can benefit both the health and appearance of your smile. These are Invisalign and traditional orthodontic braces. While they will both help you to achieve the same end result, there are a number of distinct differences between the treatments. To help you decide which is right for you, here is everything you need to know about Invisalign vs. conventional braces. What is the Invisalign treatment program and how does it differ from traditional braces? The Invisalign treatment program is the latest solution for misalignment problems. The main principle of exerting force over teeth to move them into a more desirable position is the same for both traditional braces and Invisalign. However, the approaches are quite different. Orthodontic braces comprise of metal and/or acrylic framework that is bonded securely to the teeth. This frame is then adjusted using wires, brackets and bands, which guide the teeth into their new position. The patient must attend appointments with their dentist regularly, usually every 3-4 weeks, for each adjustment to be made. The entire process can take anywhere from 12 to 24 months depending on the extent of movement that needs to take place. 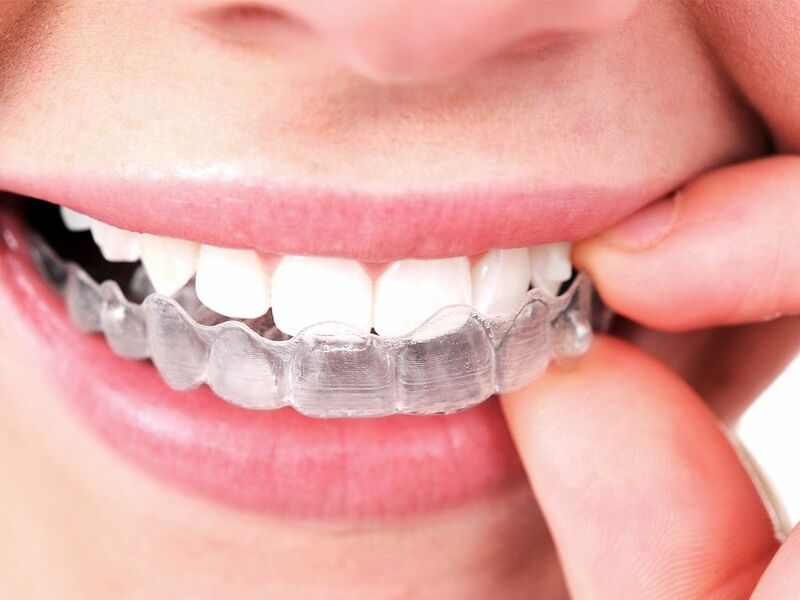 Invisalign involves the patient wearing a series of custom-designed transparent plastic aligners over their teeth. These fit very snugly to the teeth and again, exert gentle pressure over those which need to move. Each aligner is worn for 2/3 weeks before moving onto the next in the series. The pathway of treatment is created using state of the art mapping technology which takes the original position of the teeth, their preferred position at the end of the treatment, and plots the course that they would need to travel. The aligners are created to reflect this pathway. Again, the entire process can take between 12 and 24 months depending on the changes needed and how well your body responds to treatment. So, why choose Invisalign over traditional orthodontic braces? In short, there are a number of advantages to opting for the newest and most innovative dental misalignment solution. Conventional braces may be more attractive than they used to be, but they are still impossible to hide. Invisalign uses transparent aligners fitted closely to your teeth, which are virtually imperceptible once in place. A mouth full of metal and plastic, wires and brackets is never going to be particularly comfortable. However, patient that opt for Invisalign report that once they get used to the aligners they are so comfortable that they often forget that they are wearing them. Once of the biggest compromises with traditional braces is that there are certain foods that you just can’t have while wearing them. This includes things that are particularly hard, sticky or chewy as well as products like popcorn which break into tiny hard pieces that could get stuck in your brace. Invisalign aligners are taken out for eating, so you can enjoy whatever foods you like. Again, negotiating the various parts of an orthodontic brace with a toothbrush can be more than just a little tricky. Many patients find that it is simply impossible to do a truly thorough clean and they may suffer decay as a result. However, Invisalign aligners are removed to be cleaned with a simple solution, and you can just brush and floss your regular teeth like normal. There are only really two major considerations to make when opting for Invisalign instead of traditional orthodontic braces. Since Invisalign are removable, you have to be responsible for wearing them both in the right order, but also for the necessary amount of time each day. For Invisalign to be successful, patients must commit to wearing each set of aligners for a minimum of 22 hours per day, only taking them out for cleaning and eating. Failure to do this can compromise the progress of your treatment and consequently, the final outcome of the Invisalign program. Invisalign is more expensive than conventional braces. However, most patients agree that the benefits of the treatment program far outweigh the additional costs associated with it. If you would like to discuss either Invisalign or traditional orthodontic braces with our experienced and knowledgeable dentist, Dr. Cadle, our dedicated team would be delighted to make you an appointment. Please call our office today to learn more.